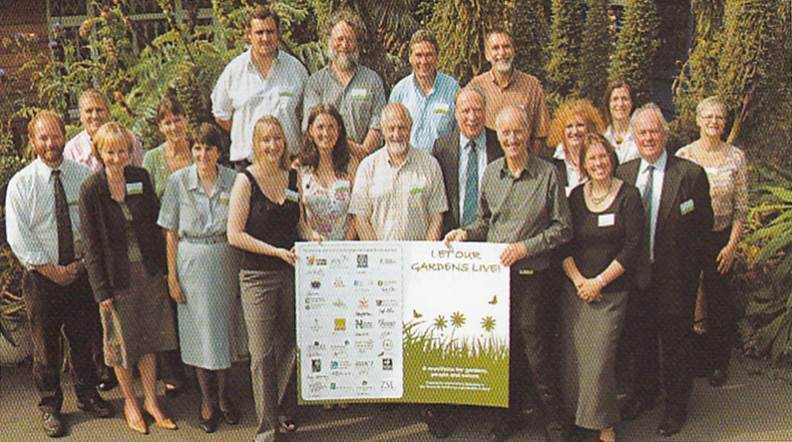 The Wildlife Gardening Forum was founded by English Nature (now Natural England) in March 2005 to encourage people to "garden with wildlife in mind". Natural England recognised that wildlife-sensitive gardening supports biodiversity in the wider countryside and can increase public interest and awareness of conservation. The Forum began with a small conference of invited conservation charities and agencies at the Royal Horticultural Society's Council Chamber. In its first years the Forum was developed and given momentum by Steve Berry of Natural England. 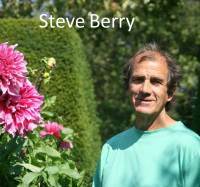 Steve set up a steering group of about ten people from several conservation bodies, and instituted a regular newsletter covering research results, wildlife gardening news and member events. The membership grew rapidly, principally through people attending conferences, and Steve organised conference workshops that helped define a philosophy and set of objectives for the Forum. From its first years the Forum was developed and given momentum by Steve Berry of Natural England. Steve set up a Steering group of about ten people from several conservation bodies, and instituted a regular newsletter covering research results, wildlife gardening news and member events. 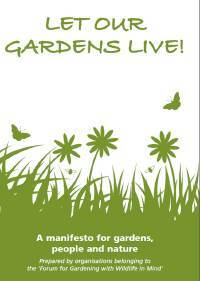 In 2007 the Wildlife Gardening Forum published its Manifesto, which set out in simple language the main issues and outcomes we are working for. The Manifesto was launched on 18th July at Roots and Shoots in Lambeth, by Sir Martin Doughty, Chair of Natural England with support from Joan Ruddock, Minister for Biodiversity. Click on the launch photo below to read a copy of the Press Release. Early in 2009, Natural England started to develop the Big Wildlife Garden Website to get families engaged with garden wildlife, and encourage them to improve their gardens to achieve increasingly higher levels of wildlife-friendliness. The Forum was heavily involved in planning and writing text for the website, which proved popular and successful. By 2009, attendance at Forum Conferences was approaching 100 delegates, and venues such as RHS Wisley and the Natural History Museum were needed to accommodate everyone. 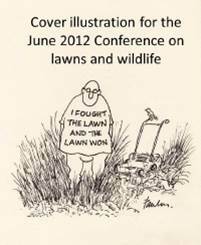 From 2010 we have held two conferences each year to be able to cover all the important issues and scientific results now coming out about wildlife gardening. Most conferences now take a specific topic as a theme, which is discussed by several speakers. Click on the cartoon to go to our conferences page. In 2010 Natural England, under financial pressure from the new government, was forced to cut back on its funding for non-core activities. This meant the end of support for The Big Wildlife Garden website in its current form (despite over 2,500 gardens registered in the first year), but it was successfully taken over by the RHS and Wildlife Trusts and incorporated into their Wild about Gardens site. At the launch of the England Biodiversity Strategy in August 2011, Caroline Spelman, Secretary of State for Environment, Food and Rural Affairs announced the government was investing in urban biodiversity by funding a national Big Wildlife Garden Competition which finished in the spring of 2012. 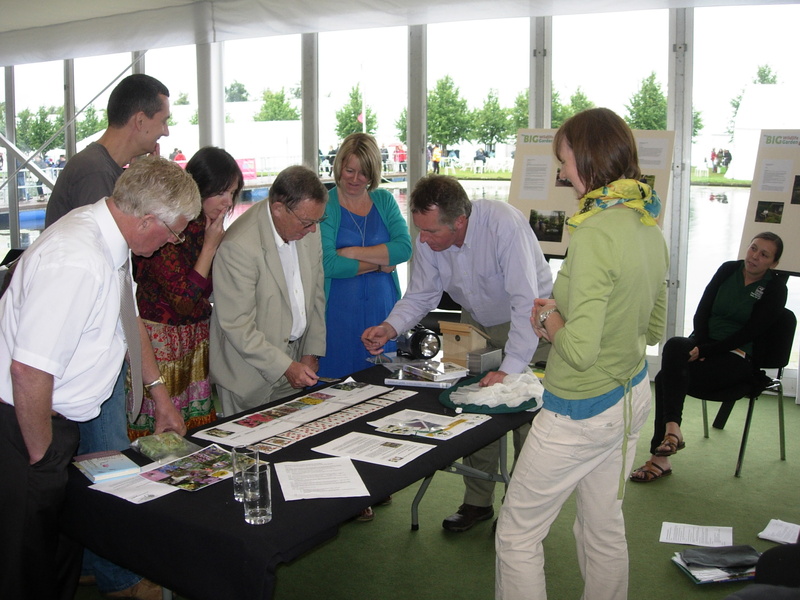 The Forum was heavily involved with the RHS and Wildlife Trusts in the design and judging of the competition, and the winners (see below) were announced at HRS Hampton Court flower show 2012, where they also took part in a wildlife gardening master-class. In 2010 Natural England, under financial pressure from the new government, was forced to cut back on its funding for non-core activities. This meant the end of support for The Big Wildlife Garden website in its current form (despite over 2,500 gardens registered in the first year), but it was successfully taken over by the RHS and Wildlife Trusts and incorporated into their Wild about Gardens site. At the launch of the England Biodiversity Strategy in August 2011, Caroline Spelman Secretary of State for Environment, Food and Rural Affairs announced the government was investing in urban biodiversity by funding a national Big Wildlife Garden Competition which finished in the spring of 2012. 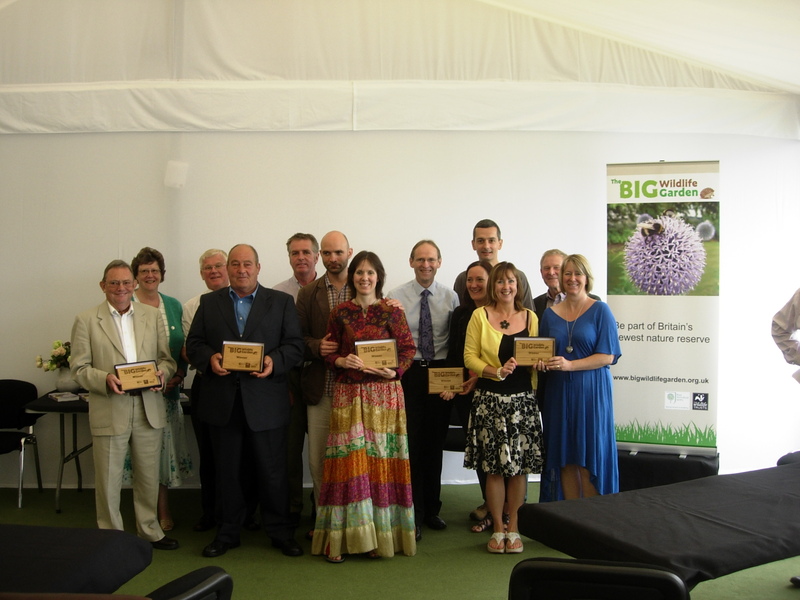 The Forum was heavily involved with the RHS and Wildlife Trusts in the design and judging of the competition, and the winners (see below) were announced at HRS Hampton Court flower show 2012, where they also took part in a wildlife gardening master-class. The 2010 cutback meant Natural England also had to give up financial support for the Wildlife Gardening Forum, although Natural Resources Wales (then the Countryside Council for Wales) was able to continue to help. The Forum Steering Group agreed to set the organisation up as a Small Membership Charity (with income less than £5,000 per year), and this was completed on 22nd October 2010, with seven Trustees. At the same time, the Board began to put together a development strategy, centred around creating a website, boosting the Forum's working groups, and spreading administrative tasks more widely. In late 2012 the Forum was awarded a two year Development Grant by the Patsy Wood Trust, and work started in 2013. This developing website is one outcome, but new working groups have become active, we have redesigned our branding, and revised and reissued our Manifesto to reflect some changes since 2007. On 9th April 2014 the Wildlife Gardening Forum was granted registered charity status as a Charitable Incorporated Organisation, among the first charities recognised under this new form of registration. You can read our Constitution here. The 2010 cutback meant Natural England also had to give up financial support for the Wildlife Gardening Forum, although Natural Resources Wales (then the Countryside Council for Wales) was able to continue to help. The Forum Steering Group agreed to set the organisation up as a Small Membership Charity (with income less than £5,000 per year), and this was completed on 22nd October 2010, with seven Trustees. At the same time, the Board began to put together a development strategy, centred around creating a website, boosting the Forum's working groups, and spreading administrative tasks more widely. 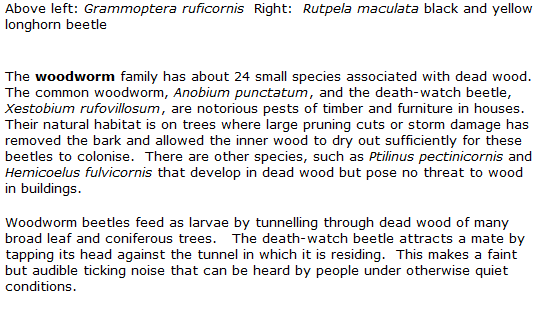 In late 2012 the Forum was awarded a two year Development Grant by the Patsy Wood Trust, and work started in 2013. This developing website is one outcome, but new working groups have become active, we have redesigned our branding, and revised and reissued our Manifesto to reflect some changes since 2007. On 9th April 2014 the Wildlife Gardening Forum was granted registered charity status as a Charitable Incorporated Organisation, among the first charities recognised under this new form of registration. You can read our Constitution here. 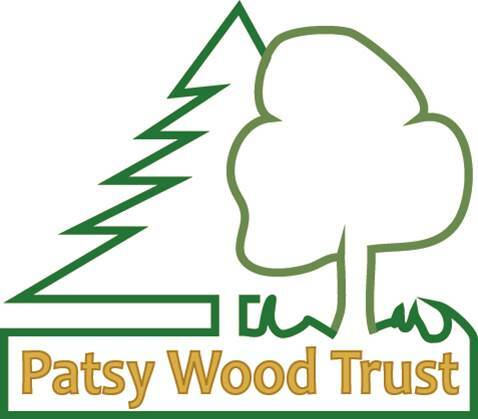 The Wildlife Gardening Forum is very grateful for the crucial recognition and support of the Patsy Wood Trust, which in her memory support's Patsy's interests in the environment and conservation, training and education, music and the creative arts.